When I was living in SLC, I always knew what I would have for dinner - whatever my momma made me! :-) But really, dinner was always a second thought to me, we always had a stocked fridge/freezer/pantry and dinner magically appeared on the table every night. Lunch the next day would be a sandwich or some form of leftovers. Quando abitavo a Salt Lake, sapevo sempre quello che mangiavo a cena - quello che mi faceva la mamma! Non ci pensavo molto alla cena perche' teniamo il frigor sempre pieno e la cena c'era sempre in tavola alla sera. Per pranzo, prendevo su' un panino o dei avanzi. Now that I live on my own, I have to cook for myself. I love it because I love cooking, but sometimes I dread it. After working all day with children and having to be cheery and exciting, the last thing I want to do is make dinner. Adesso che abito da sola, mi devo fare da mangiare io. Mi piace perche' mi piace fare da mangiare, pero' certe sere, non ho voglia. Dopo essere stata tutto il giorno a scuola con i bambini essendo contenta e piena di energia, l'ultima cosa che voglio fare e la cena. Therefore, I meal plan. I try to meal plan on Saturday's/Sunday's so that I can go to the store and buy everything. Since it's just me I'm cooking for, I only cook a few nights a week and the other nights, I eat leftovers. It's been working pretty well because this way, I still cook something new, but it's not every night, so I'm not overwhelmed. It's also great because even though I have a plan, it's not set in stone so it/I can be flexible. Allora mi faccio un menu' ogni settimana. Di solito faccio il menu' al sabato o domenica cosi' ho tempo di andare al mercato a prendere quello che mi serve. Visto che faccio da mangiare solo per me, cucino solo un paio di giorni alla settimana. Cosi', ho sempre qualcosa di fresco, pero' non devo cucinare ogni sera. Poi, posso sempre cambiare piano se voglio. Here's what I do. I make a list of everything I have in the fridge. I usually clean out the fridge at this time and throw out anything that's old. I look in the freezer and do the same thing. Anything that can be used for a meal, I write it down. Usually my lists have items such as milk, fruit, salad, chicken, etc. Then, I think about what I want to eat during the week. 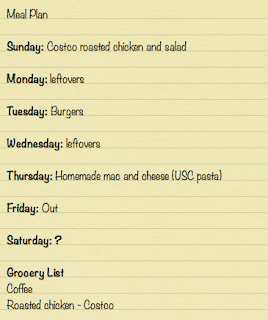 I look at my schedule and think about what I have going on and the best nights to cook. I have to keep in mind that I have to bring a lunch everyday, so I need to make sure I have food to bring. I usually keep Friday nights open for going out for pizza and Saturday's are hit and miss just depending on my schedule. La prima cosa che faccio, e' che mi faccio una lista di tutto quello che ho in frigor e nel freezer. Faccio anche un po' di pulizie nel frigor buttando via le cose che sono andate a male. Tutto quello che potrei usare a cucinare, lo scrivo. La mia lista di solito ha queste cose: latte, insalate, frutta, e pollo. Poi, penso alle cose che vorrei mangiare nella settimana. Visto che io mi porto da mangiare a pranzo, devo essere sicura di fare da mangiare nei giorni che dopo lavoro. Venerdi' sera di solito vado a mangiare la pizza e sabato non so' mai quello che faccio. 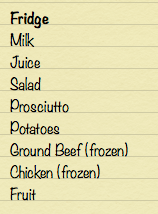 Then, as I plan each of my meals for the week, I make a list of what I need to buy to make it. Thus creating my grocery list. Since I just use the notes app on my phone, I add things to it during the week as I run out of them. This has helped me so much just budgeting food money and having a nice home cooked meal almost every night. Poi, scrivo tutto quello che voglio mangiare nella settimana. In tanto, mi faccio la lista della spesa. Io uso una applicazione sul telefono, cosi', se rimango senza qualcosa durante la settimana, la posso aggiungere. Questo mi aiuta molto quando devo andare a fare la spesa perche' so gia' quello che mi serve. There's not many things on my list this week because I always have certain things in stock. Now that I have my plan, I can go grocery shopping! Non ci sono tante cose sulla lista questa settimana perche' ci sono certe cose che ho sempre in casa. Adesso che ho la mia lista, posso andare a fare la spesa!